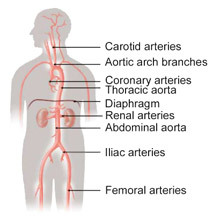 supply blood to the brain through the carotid arteries, and when diseased, frequently cause life threatening strokes. supply blood to the heart and, when diseased, can block the flow of blood and cause a heart attack. This is a cardiovascular disease and is primarily managed by heart specialists – cardiologists. supply blood to the kidneys and, when diseased, can cause high blood pressure and eventually, kidney failure. supply blood to the hip and the legs and, when diseased, cause leg pain with walking (claudication), often in both legs. supply blood to the legs. If they become diseased, it may cause claudication, usually in the calf muscles. This lack of circulation can lead to continuous pain in the toes and foot, and may progress to the development of gangrene.